We have officially completed our first month as a homeschooling family!!! We have settled into a routine and are slowly figuring out what works for Nora and what does not. So many of you have asked to see what we have been up to and I so appreciate your involvement and interest!!! First let me reiterate the fact that I love the idea of 'unschooling' at Nora's age more than any structured curriculum. For instance, just helping us stack wood last night, she found a piece shaped in the letter "N." This was an exciting teachable moment for daddy and I. Not only was she helping us because 'she is part of our family and it takes every one's help to make this home work...' but she was pretty proud of her "N," and thought it was put there especially for her. She has been in quite the mood lately. Notice her hair in the above picture? She asked Aunt Jeni to give her more ponytails because "Jayna has hundreds of ponytails in her hair..." When Jeni finished, Nora went to the bathroom and came back out fake crying. She said, "Aunt Jeni, I'm crying because I can't believe how pretty I am." And then she put a pretend curler in the bottom of her hair that hung there until bath time last night. She also put on two different shoes that "aren't matching" to help with wood. 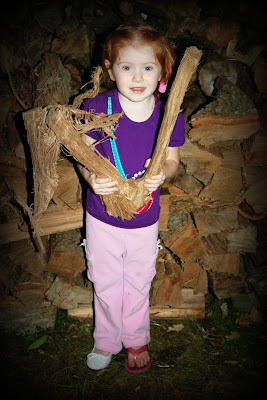 So generally speaking, our 'Hands On Homeschooling' curriculum for preschool age is far too simple for Nora, meaning that she is further advanced in the things that she already knows. I still love the structure and set up of the curriculum but have filled in some of the gaps with my own ideas on certain days. 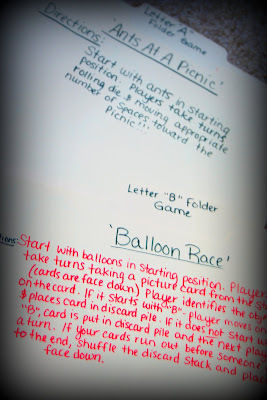 I remember Tiffany telling me (when she did this curriculum with her daughter last year) that she loved the hands on approach because she wasn't a huge fan of worksheets. I think the same will be true when I begin teaching Braden. Nora, on the other hand, is a girl after my own heart. She is a writer. She loves paper. She loves the feel of a marker or pencil in her hand. And she enjoys worksheets. So we have been doing more writing and worksheets than are scheduled into her actual curriculum. This is the beauty of teaching your kids at home! You can do what works for each child individually. We focus on one letter per week. 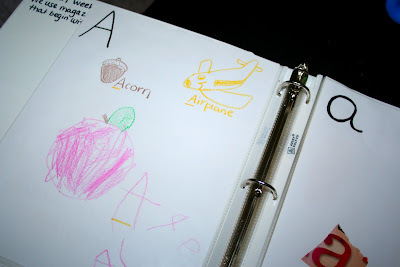 Each week we fill in pages of Nora's letter book with pictures of words that begin with that letter. She either draws the pictures or cuts them from a magazine. 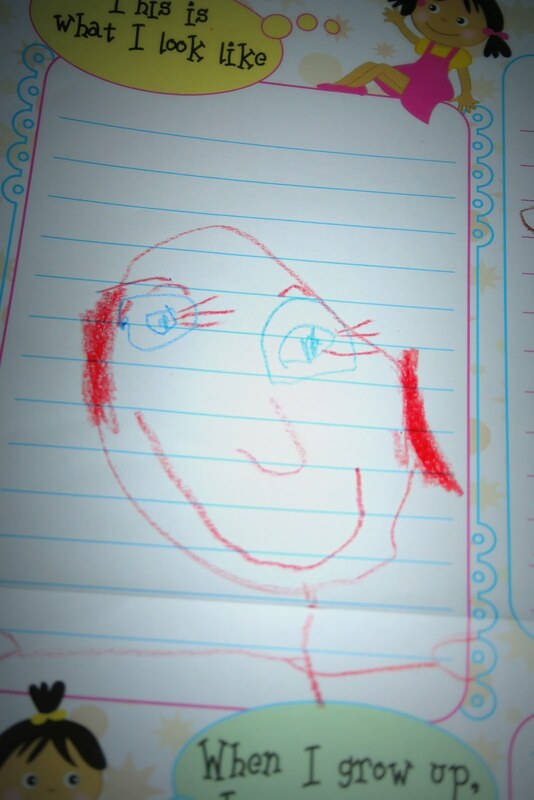 This is Nora's A page. I demonstrated since it was the first week of doing it. 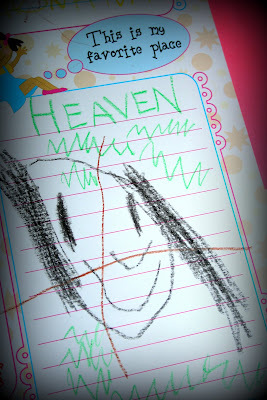 ...and her idea of Jesus on the cross when she told me her favorite place to be was "Heaven." 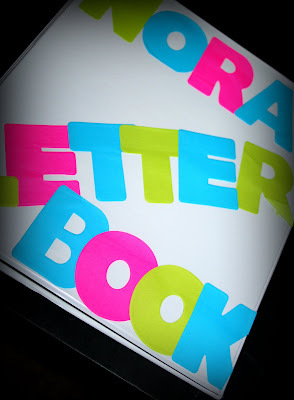 Each week we also create a "folder game" for the letter of the week. 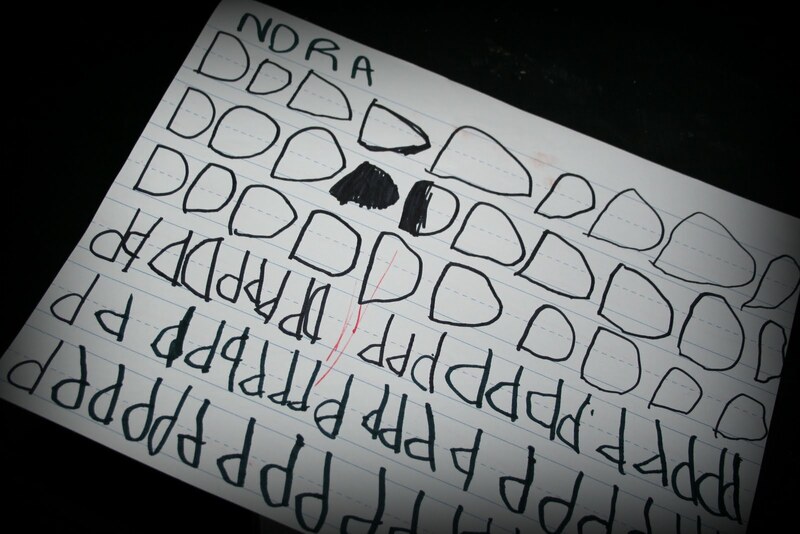 Again, Nora already knows every letter and can recognize what any word begins with. She knows the sounds that they make and is beginning to put them together to form words when 'reading.' 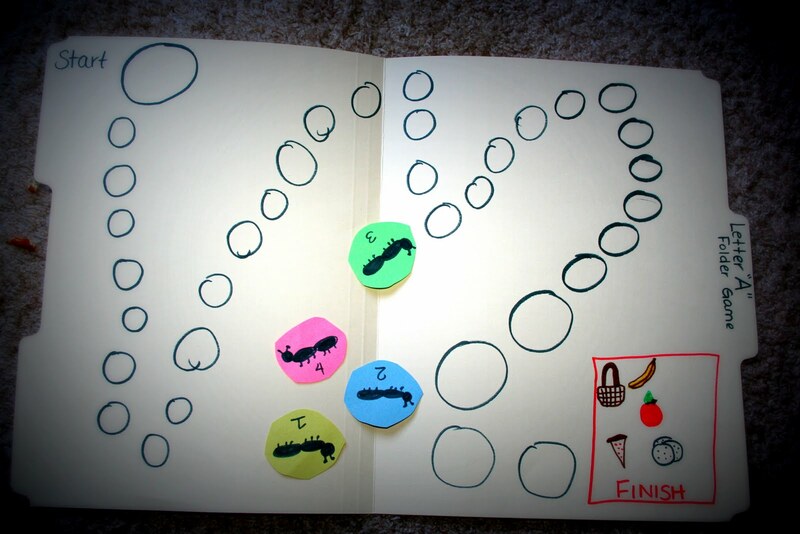 But this gives you an idea of the 4 year old curriculum. 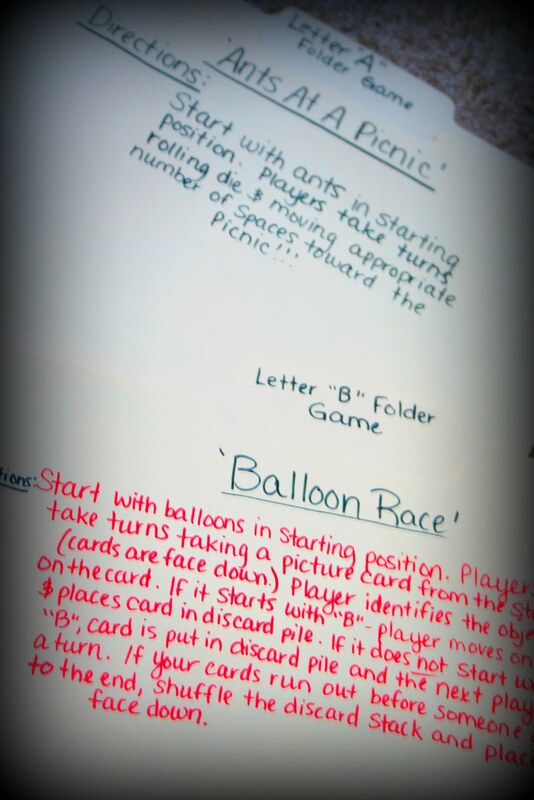 We usually create the folder games together and play them a few times while Braden is napping for the day. When daddy gets home from work and brother wakes up, we all play them together. Braden doesn't understand the concepts of most of the games as well, but he is learning to be involved and that's all that matters right now. Every day we are studying a Bible story. We focus on one each week. 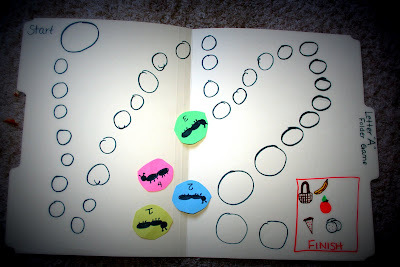 We do crafts that are focused on the story and spend time talking about it each day. 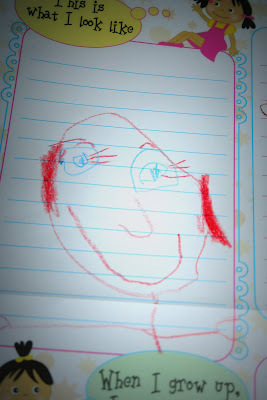 We are sure to tell daddy what we learn each night and he is always super impressed with Nora's ability to remember and understand what she is learning from the Word. "Whatever is worthy of praise, think of these things." Both kids memorized this verse during the first week. On Wednesdays, we have cooking. The first week was Applesauce, the next was Banana bread, last week we switched it up and made cake. This week Nora and I needed some alone time so we went to lunch and practiced 'dipping' for the letter D.
I want to make it clear that most of our learning is taking place outside of the classroom. My hope is that Nora is learning important life lessons every single day just by being with me. For instance, we completely opted out of curriculum a couple days ago because we went grocery shopping. I had a list, we found the items on it, paid for the items by writing a check and had interaction with the cashier about money. Nora watches everything so diligently and I know she's learning because of it. All in all, school is going great. I am most excited about the potential of Nora learning to read this year although I won't start an actual reading program until it's much colder outside. For now, we are spending time outside playing and enjoying this time soaking up the changing season and lots of life lessons. Although there have been a few discouraging comments along the way, I am extremely thankful for the support and understanding that we are generally met with when telling someone that our children will school at home. We are for a good education. That is precisely why we have made the choice to homeschool so we have some sort of control over what our children will be taught and how effectively they will learn. I cannot get angry at people who just do not know any better. It's a shame to live so ignorantly. I'm a huge believer in the idea that just because you don't understand something; in this case- the choice to homeschool- doesnt mean you shouldnt educate yourself on it. Let me say this one more time: Daniel and I are not against education outside of the home. But we are against a system that is not effectively teaching our children and preparing them for the future. Also, we are not concerned with our kids' social standing. Need I remind you that they are currently 4 and 3 years old? Socially speaking, our children are outgoing, outspoken and intelligent. They will certainly do just fine in the area of friends when that is a more relevant concern. When told that our children will act like "zombies" when they are older, Daniel simply responded with a smile. We know what we are doing is the best choice for our children and our lives. We have favor from the Lord and believe that we are in the center of His will in all areas of our lives, including this most important area of teaching our kids. I'm daily trusting in God to redeem my shortcomings while teaching these children. I know His hand is upon this plan and we are thankful that He steps in when our spirits step out. There are days when I feel so inadequate and yet Nora learns something so great. There are days when I feel the enemy and his lies settling into my spirit and the Lord rushes in and shows me truth through the eyes of this little girl. We are doing it and there is no looking back. We are moving forward in this journey and we do so with great hope! "And again, I will put my trust in Him. And again, Behold I and the children which God hath given me." You may want to look at the Christian Light Publications Kindergarden Curriculum for Nora or some of the curriculum at Accelerated Christian Education. Right now, my 8 year old is doing ACE, and I'm starting my 3 year on it when he turns 4 next summer, when he's done with the Abeka Preschool Program. From what you posted about her learning style, I think any one of these programs would be right up her alley. It's worth a look anyways. Ramee, Are you a member of MOPs? A group of women from my church are in this organization, Mothers Of Preschoolers. I believe that it is a national organization, with groups all over the place. From what I understand, a lot of the women home school and also belong to home schooling groups, mostly with other christian families. 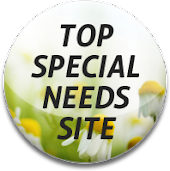 If you would like me to try and get the websites for you I can. I hope and pray that when I start raising a family that I will be blessed enough to be able to home school. Heather--we are planning to use the ACE program starting next year with Nora. I wanted us to both get used to a schedule for now, but not a strict structure quite yet. I graduated high school using ACE and LOVED it!!! Hey Ramee...don't get it let you down..you choosed the right way for your kids no matter what other people say. It's like you said..they don't know anything about it, so it's not the right thing for them.Those people have kind of a limited horizon...just ignore it. Good luck with homeschooling! !I think Nora is an enquiring child and she will develop well with you teaching her at home.